Currently I'm working on a 3D DLP printer as my final bachelor assignment for university. This is why I'm working on a DLP printer with not only Z-axis control, but also X-axis control. I'm at the planning phase of the project, and I have read that many people use a 'motherboard' for their 3D printer. Since I already have some powerful stepper drivers, (Big Easy Driver, which doesn't fit like the Pololu's) and for a DLP printer I wouldn't use the MOSFETS for the heaters and fans, I concluded that I might be able to connect the drivers (and endstops) to an Arduino board directly. (And powering the motor drivers from a 24V source directly). Could someone confirm me that this assumption is right? 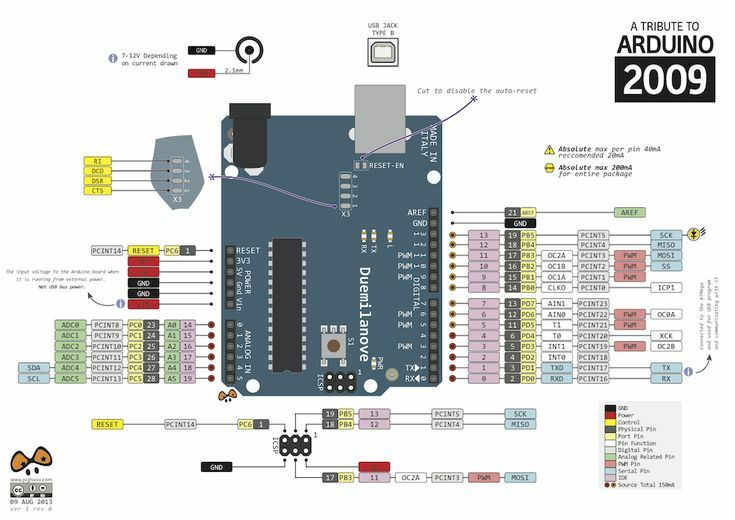 I already have a Arduino Duemilanova with (ATMega328P) board at home and I would like to use it for controlling the motors. Will this microprocessor be fast enough and have enough memory to be used with the Marlin Firmware? The firmware says: for the X-motor: use pins ;17,18,19; and for te z-motor use '4,2,3,13'. An Arduino Duemilanove only has (analog pins: 0-5) and (digital 0-13) printed on it so I suspect that the values refer to the 'Physical Pin' values, as described here: *3? Could someone confirm this? Partly using a tutorial for the setup of a 3D printer (by Henk van de Sangen)*4, I would like to get the system working. In the end I will have to dive into the 'Creation Workshop' software, programming some motor commands to change the VATs after printing. Finally I would like to program/modify a slicer to make slices for every different material, to be able to change the material while printing. I'm using a DLP beamer of Benq: PB7230*5. It uses a 5 Segment color wheel (RGBWY) I've 3d printed a 5mm thick spacer to fit between the lens assembly and the DMD to decrease the projection size & distance. I'll hope it will work, monday I'll test it. On this forum and in the 'Hardware guide' supplied by the Creation Workshop install I've read about people moving the color-wheel assembly aside(not removing!) to decrease the amount of UV blocked. I was wondering if some people have actually tested how big the influence of this modification is, since I suspect it wouldn't change alot. I was also wondering if someone has tested how big the amount of light is that is blocked by the lens-assembly. Since the glass in it seems to be very thick, I would expect that it blocks quite a big amount of light!